The story of this year’s Dreamforce might best be told through the partner community and AppExchange and that makes it a story about the platform. Appropriately enough, Salesforce teed up the platform topic in Chairman and CEO, Marc Benioff’s keynote and the press conference immediately following it on Tuesday in which he announced Salesforce 1. 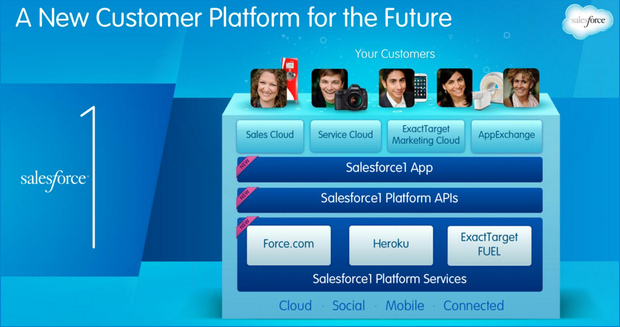 Salesforce 1 is more than a rebranding exercise, though Salesforce is certainly adept at that. The new branding reflects a consolidation of important components that have become part of the platform organically but it also makes a statement about what Benioff and his company believe is the appropriate configuration for a modern IT tool worthy of the descriptor. As the company has done many times before, it has again set the bar for the IT discussion for the year ahead. You might recall that last year Benioff announced the importance of the Marketing Cloud and along with some other important events that year like Marketo’s IPO, Oracle’s purchase of Eloqua and other properties, and Microsoft’s purchase of NetBreeze and Marketing Pilot, the market took the hint and went long on marketing. So look for the platform to be the hot topic in the next twelve months. However, it should be said that platform is not the story; it is only the enabler of the story. As I mentioned at the start this is about partners building native applications on the platform or building complementary solutions that utilize the platform’s API set to make the differences between their solutions and Salesforce vanishingly small. For Salesforce this is huge because healthy partners—i.e. companies that sell your platform along with their solutions—are just what the company needs as it works to secure a place in the Fortune 500. I have been writing about that inevitability for a while but the combination of Salesforce’s own growth plus that of its partners gives a boost to the effort that many other companies can’t match. Dreamforce is being held in three buildings and there are campgrounds and exhibits in each building, moreover, partner companies have rented out entire restaurants in the neighborhood for meetings and demos. But it’s not simply a question of numbers though they give the argument critical mass to give you a sense of the size of the partner opportunity, here are some of my favs. Apttus is known for its configuration, pricing, and quoting solution and more generally for its support of the order to cash process. You already know that quotes need to be meticulously drawn up but did you have any idea of the detail that goes into the process? Traditionally salespeople have used Microsoft Office to put the configuration together, do the math, and write the proposal. But they have used the Office elements without much synchronization with SFA. Apttus changed that by developing technology that enables Salesforce and Office to work closely together. They’ve also linked in DocuSign to deliver the proposal signature ready. Apttus has other technologies too but that’s enough to show their worth. 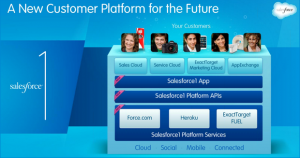 FinancialForce.com is a good example of front to back office process integration that is enabled when a single platform undergirds all applications. FinancialForce.com’s financial management suite includes accounting modules that every business needs including General Ledger, Accounts Payable, Accounts Receivable, Ordering and Billing, Reporting and Dashboards, and Cash Management. Additionally, FinancialForce.com offers a Professional Services Automation (PSA) application that enables sales and services teams to work in the same system, using the same information in a collaborative working environment, enabling processes to flow naturally from sales to services, with full visibility. InsideView has built a business based on information capture and distribution to sales and marketing people who use it to fuel their business processes including account management. This intelligence gathering is, I think, a new kind of business process that supports other approaches based on social media. I also think this approach will be important in a future that puts increasing numbers of machines online. ServiceMax is rethinking field service, and delivering cutting edge business solutions to help companies perfect service delivery, drive revenue and growth, and delight customers along the way. ServiceMax supports modern field service business processes with a native Force.com application that works with Salesforce Service Cloud and shares common objects and customer data. Xactly started as a sales compensation management solution delivered through a SaaS model but the company has broadened and deepened its offering. Today it does that but it also is budding out into corporate governance and ensuring that not only sales people have plans and objectives. Xactly adds another dimension, governance, to Salesforce beyond what FinancialForce or Zuora offer and I think governance is the next big this for Salesforce to contemplate. Speaking of Zuora, this company was one of the earliest movers in the subscription billing and payments market. Back when no one else saw the building problem of trying to bill and deliver at scale for subscriptions, Tien Tzuo started the company. Zuora has attracted a lot of imitators, which is good because it proves there is a market. Tzuo and his team has built a financial management system for subscription companies that also fits the subscription business neatly into traditional business. Like many other companies, Zuora had its own customer education event the day before Dreamforce started. With well over $130 million in venture funding, the company has to be getting ready for an IPO but on its terms because it’s also generating cash from what I can tell. If you ask the CEOs of these companies about IPOs they will develop a strange far away look in their eyes and feign incomprehension of English or they’ll smile and say something noncommittal. Either way they all have venture capital and eager investors and I hear that the economy is improving. Certainly Wall Street seems healthy these days. But what do I know, I’m just one of those analysts who looks under the hood to see how the engine is running. What do I know about finance?